This second floor, 2BD, 2BA condo combines mid century charm, perfect touches of Spanish style and a great South Palm Springs location. Designed by famed architect William Krisel, this end unit home, is part of a four building campus surrounding a central pool and green space. It has an astounding 44' private patio overlooking the east courtyard, as well as having amazing western mountain views. Inside, restored Saltillo tile flooring extends throughout the home's freshly painted interior, and across the patio. Here, a re-faced galley kitchen, with new granite countertops, connects to an open dining area and the expansive living room. 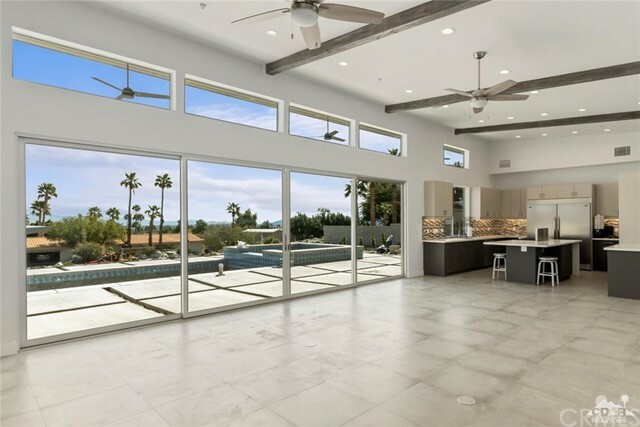 2 sets of sliding doors open to the east patio, allowing for effortless indoor/outdoor living. Extending the length of the unit, the patio ends at the master suite. This generous room with ample closet space and great attached bath, is the perfect retreat. The 2nd bedroom opens to the living room and also has hall access. The adjacent hall bath is lovely. 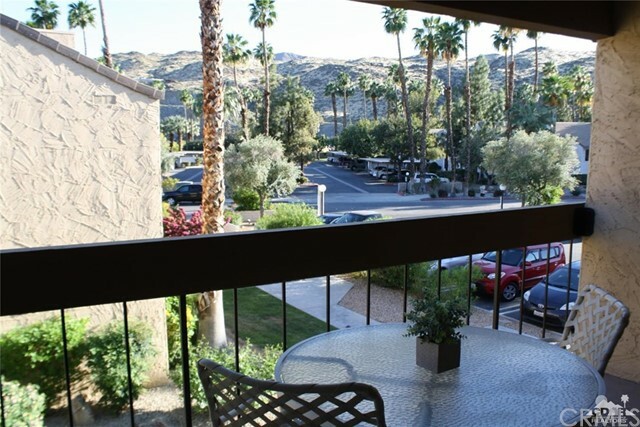 If efficient, uncluttered living inspires happiness, then paradise awaits with this 1BD 1BA condo in Palm Spring Villas. An updated, second story unit, #210 provides perfect southern views and overlooks one of several community pools. HOA rules allow short term rental so this space-aware dwelling could possibly generate passive income in addition to being the perfect lock-and-leave vacation home. The quiet architecture of this lushly landscaped community incorporates low sloping roof lines with large overhangs that create a refuge of shade for each building. It is here where 210's front patio is located, an ideal sitting area to enjoy the views. Inside, the bright open floor plan includes the living room and dining area, with real bamboo flooring throughout. The updated kitchen boasts maple cabinets, new granite countertops, and plenty of storage space.The large bedroom is inviting with ample closet space. The full bath, with clean white color palette even has new glass shower doors. The perfect quiet retreat in Andreas Hills - one of just 26 homes designed by mid-century architect, William Cody. Over 2000 sq ft, beautiful mountain views AND Privacy within 7 acres. Generous Master Suite with 2 walk in closets and spacious bath. Roomy Guest Suite is at opposite end of home. Kitchen has breakfast island, lots of cabinets, big pantry and sunny breakfast area looking out to courtyard. Living Room has fireplace, vaulted ceilings and gorgeous VIEWS. On Fee Land to boot! Everything is in well kept original Condition - just waiting for someone's personal touch. 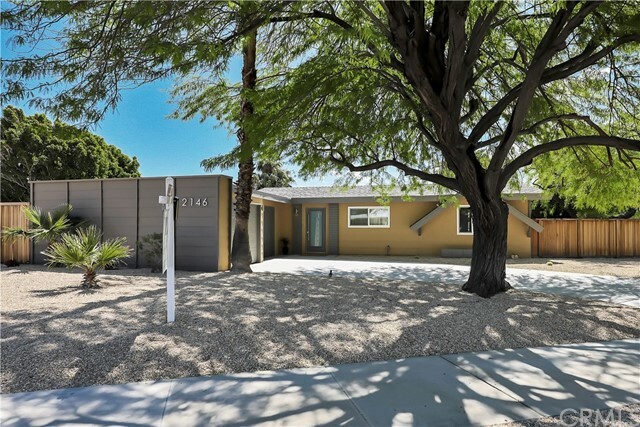 Meticulously remodeled three bedroom, three bath residence provides for quintessential Palm Springs indoor/outdoor living. Special attention to detail begins with the impressive curb appeal - desert landscape and lighting and freshly poured driveway long enough for additional parking. It's a stunning contemporary design that includes crisp white color palette and beautiful accent walls. Some of additional features to the home include newer dual pane windows and doors, remodeled kitchen and baths, new lighting and plumbing fixtures throughout. Separate living and family rooms which overlook a sparkling pool. Spectacular mountain views. NO HOA and you OWN THE LAND! Custom Mid Century Modern Masterpiece. Enjoy the spectacular mountain views from the main residence, detached guest house or while lounging poolside. New Construction Mid Century-Modern home offers, 3 Over-sized bedrooms with walk in closets,2.5 baths, Great room,Formal dining room, Billiard Room, Laundry Room, Gourmet Kitchen with high end finishes, stainless steel appliance, contemporary flat panel cabinets, electric linear fireplace with multi-color flame presentation and much more. incorporating energy efficient design elements such as High efficiency AC and heating system, tankless water heaters. Detached Casita offers a living room / Bedroom , walk in closet and more. Located within walking distance to downtown Palm Springs, this private oasis is the place to be! Modern architecture, owned SOLAR & Fee Land are just a few reasons you will want to own in Alejo Vista. This stunning townhouse boasts its own private saltwater pool/spa with stunning west-facing mountain views. Cathedral ceilings, an open floor plan with gourmet kitchen, laundry & a spacious living room with gas fireplace create the perfect setting as you look out to your private backyard & glimmering pool/spa. The upstairs Master en-suite is spacious featuring a luxury spa bathroom with a whirlpool tub, large party stall shower, dual vanities & a balcony with spectacular views! At the top of the stairway is a perfect location for an office or sitting area. The downstairs master suite features a large walk in closet, beautiful tile shower stall & privacy for guests. The oversized 2 car garage & guest parking within the gated community finish off this amazing home. You own the land on this little slice of Palm Springs Paradise! Fantastic Mountain views from your balcony. A wonderful unit, comfortable light and bright Studio with a spacious bathroom and plenty of storage. Sit back and enjoy the awesome mountain views from your living area, kitchen window and large balcony. This is an upstairs unit at Palm Springs Golf & Tennis Club located in South Palm Springs. The community offers 3 large pools, 4 spas and 4 tennis courts. 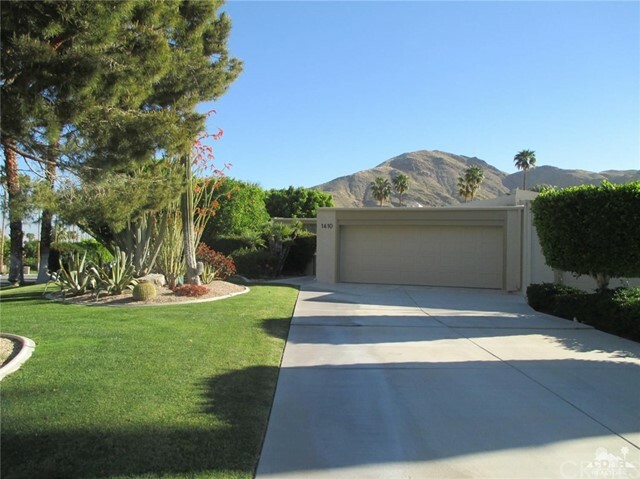 Easy walk to Tahquitz Creek golf course, Trader Joes, Starbucks, Grocery store and many restaurants. Great as a primary residence or a 2nd home away from home. All this and low HOA dues and on fee simple land (not lease land).